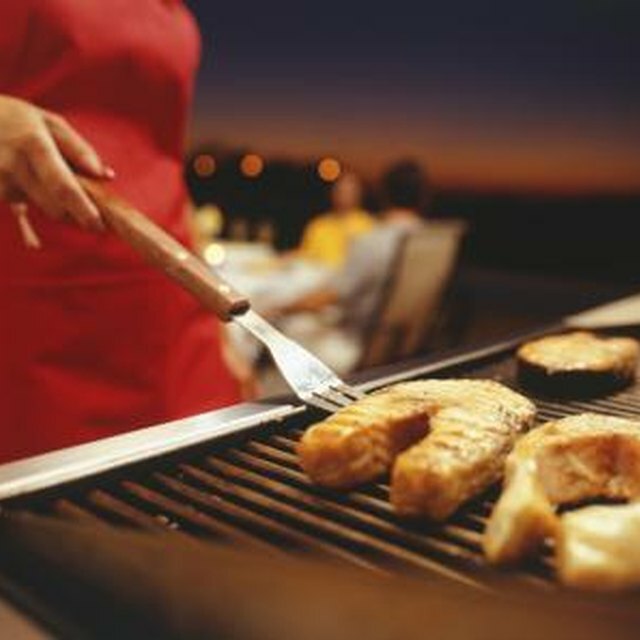 Popular outdoor living activities include cooking, dining, swimming, relaxing and entertaining. Outdoor cooking and outdoor kitchens are some of the most popular ways to enjoy the outdoor areas of your home. Today's outdoor cooking experience ranges from a simple fire pit to a fully appointed outdoor kitchen and dining room, accommodating every budget and style. Backyard brick grill designs are some of the easiest and most economical to build to begin enjoying cooking and eating outside. Design your backyard brick grill as simply or elaborately as your space and budget allow. Incorporate a simple brick alcove for a portable outdoor grill with an attractive brick patio and built-in seating for an economical outdoor kitchen. Surround a frame with mortared brick after making a three-sided, open-front frame from 2-by-4 inch lumber. Excavate the patio area, cover it with a layer of gravel then sand, and inlay bricks in an attractive pattern, tamping them into place, and bordering the space with bricks. At each corner, sink 4-by-4 inch treated posts into cement footings and surround them with mortared bricks and decorative fence post caps. Build benches between the fence posts for seating for an economical brick grill and patio area. Build a large brick grill into your patio area by using a large firebox with a chimney, mounted on cast iron legs. Mortar bricks around it, leaving the front under the firebox open for storage. Put a cast iron log-holder in the storage area and a cast iron grill rack on legs in the firebox, with firebricks underneath on which to burn wood. Extend the grill with a kitchen work counter next to it by surrounding a wood-framed cabinet with matching mortared brick and adding a cement slab counter top. If a water source is nearby, run a water line to the area, add another cabinet with a sink, or an under-counter sink. This design is flexible, and is made easier with unfinished economy cabinetry instead of building your own forms. Build an attractive outdoor grill in a circular design. Dig down 6 inches, put down a layer of gravel and a layer of sand and put down a layer of bricks around the outside circumference of the circular area. Mortar the bricks in place to the desired height, top with decorative capstones and insert a cast iron grill on legs in the middle. Make your circular grill the central focus of your patio or build it in a corner, adding seating, storage or work stations on either side. Keep your brick grill very simple by constructing a three-sided mortared brick grill station. Stack and mortar bricks 3 feet high with an open front, building a left, back and right wall without a top, capped with decorative capstones. Insert a grill set on legs or mortar a cast iron grill rack into the structure half way up the height of the walls. Add more than one grill rack if desired, or a rotisserie spit above the grill rack, for extra grilling options.